I am inspired by quilts. I especially love Amish quilts. I love the clean design work and the stunning use of color. And everything can inspire the way I dress. Here’s how a beautiful quilt can inspire a modern girl to get dressed. I found this stunning quilt on quiltstudy.org. That’s the comprehensive site of the International Quilt Study Center. It’s a fantastic place to learn and to ooh and ahh over beautiful quilts. 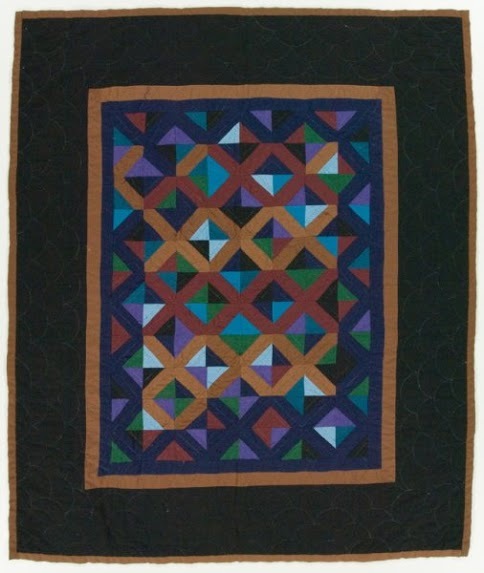 This quilt was done by the Miller sisters in Ohio in 1991. The color, movement, and sheer modern design inspired this outfit. So I started with the draped t shirt by Alexander Wang (via Moda Operandi) paired with some denim by G-Star and added the all important accessories: an armload of bracelets by Reminiscence, Givenchy Cat Eye Glasses (via Net-A-Porter) , and metallic flats by Jeffrey Campbell (via Need Supply Co.). I’m good to go.